It was a reunion of the fashionable First Ladies. Last week, fashion pundits had their lenses trained on what Michelle Obama and Peng Liyuan would be wearing during Chinese President Xi Jinping's week-long state visit to the United States. 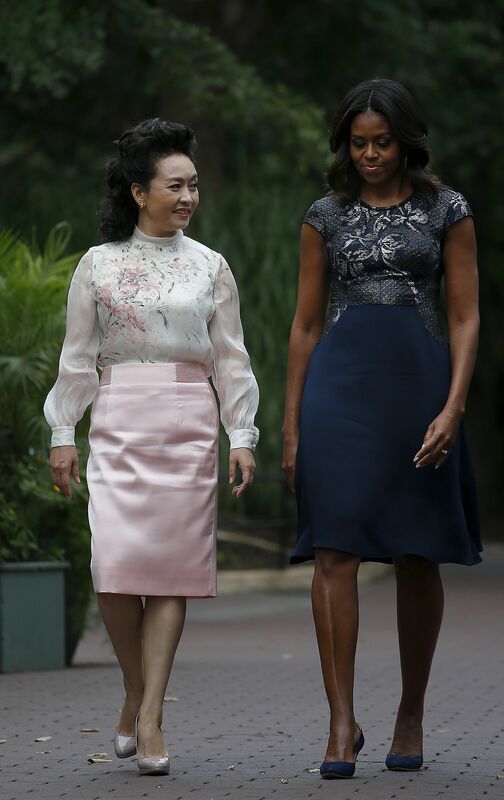 The last time both Mrs Obama and Ms Peng had a fashion face-off was in March last year, when the Obamas visited China. Style watchers, including The Straits Times, closely observed what both wore during the trip, and Madam Peng came out top of the style stakes with her elegant ensembles. This trip again proved that while Ms Peng, 52, is no fashion risk-taker like Mrs Obama, 51, she knows what works for her, and works it well. Hers is a modern Oriental chic - think Chinese silk brocade jackets cut sleek and paired with pencil skirts, and conservative jackets with Chinese-style collars, artfully accessorised with statement jewellery or featuring unusual accents such as contrast piping and colour blocked sleeves. Some might like their First Ladies sartorially-experimental - Mrs Obama in her Vera Wang off-the-shoulder mermaid gown with side swept long hair at the White House dinner last Friday. But we prefer the elegant, sophisticated and dignified look. Here is a selection of Ms Peng's looks we love, from her recent US trip as well as other state appearances this year. Ms Peng opted for this light, ethereal look for her visit to the Smithsonian Zoo in Washington on Sept 25, where she announced the name of the giant panda club, Bei Bei. Her chiffon-looking top with billowy sleeves features a watercolour painting-like floral design which extends to her shoulders. The pink of the floral pattern matches her pastel pink skirt perfectly, and together with the way she wears her hair, the look is elegantly youthful. Her white and blue ensemble is modern Chinoiserie chic - the silhouette is traditional but the details add a freshness to the look, from the navy piping to the blue colour blocking on the sleeves. She is on trend with her accessories - box clutches are in, and so are brooches. We especially love her flower brooch and little pearl button at her collar - they go together perfectly. Ms Peng likes her pastels, as seen in this matching skirt suit with contrasting panels that she wore to a welcoming ceremony for New Zealand's Governor-General Jerry Mateparae in Beijing in July. Her top features a mandarin collar but with a modern twist - one lapel is artfully turned out. This outfit is a fresh departure from her usual monochromatic skirt suits. Always one to pay attention to detail, she loops the end of her belt here so it looks a little more interesting and neat than just letting the end hang loosely. 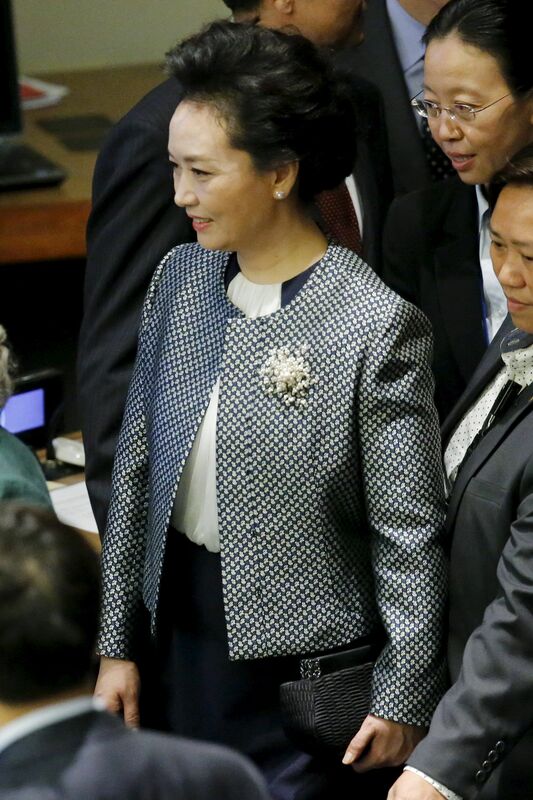 For a meeting on Gender Equality and Women's Empowerment at the United Nations headquarters in Manhattan, New York, on Sept 27, Ms Peng went for a more sombre coloured skirt suit. But it is by no means boring. The navy jacket features an unusual knot-like print, and she accessorises with a brooch featuring an abstract cluster of little pearls. She wore the same jacket for another event on the same trip, but accessorised it with a flower brooch. Our least favourite look from this trip. 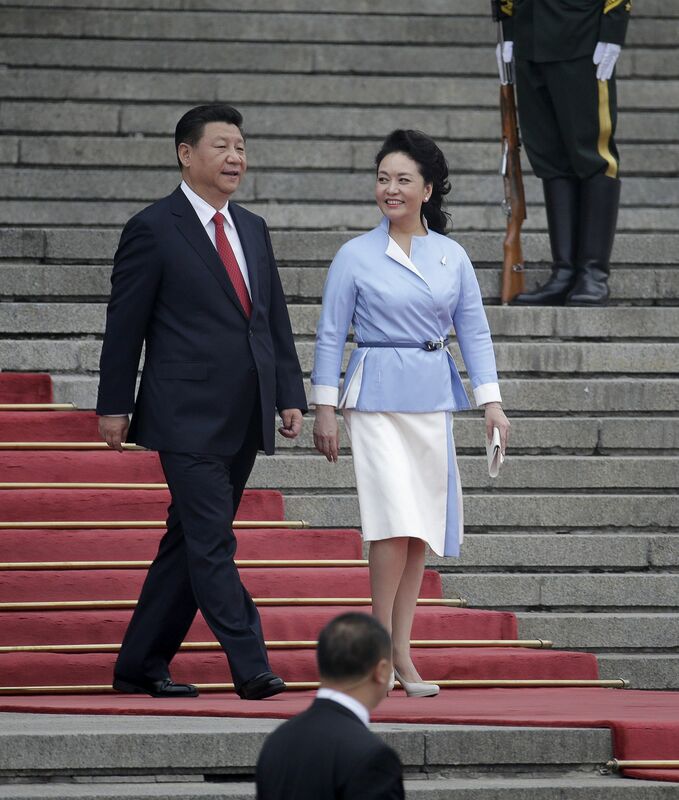 Ms Peng's teal blue gown looks a little old-fashioned and frumpy. But it still looks more appropriate than Mrs Obama's outfit. With her side-swept locks and the off-the-shoulder gown's form-fitting silhouette, Mrs Obama seems to be channelling Modern Family sexpot Sofia Vergara at a Hollywood red carpet, instead of stylishly elegant First Lady at a White House gala dinner.